The Go Fish card game is for 2 to 6 players but plays best with 3 to 6. To collect the most sets of four. 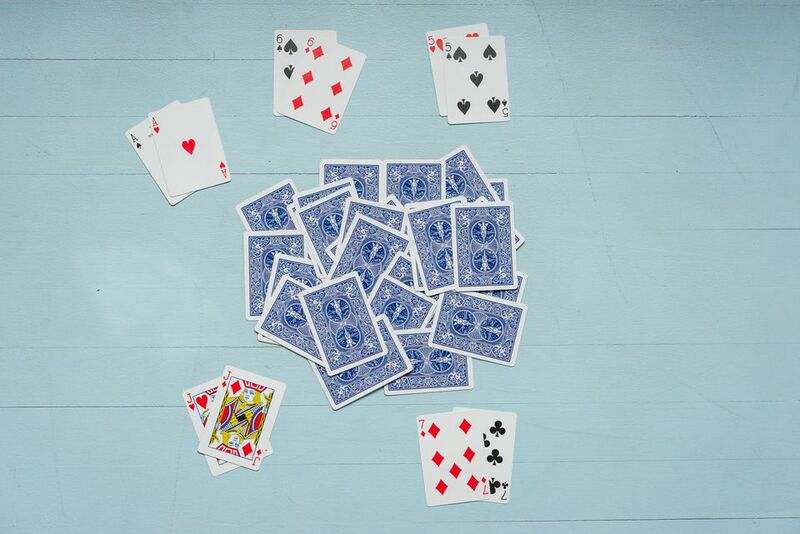 Five cards are dealt to each player if three to six players are involved. With only two players, seven cards are dealt to each. All remaining cards are placed face down in a draw pile. Randomly choose a player to go first. On your turn, ask a player for a specific card rank. For example: "Barb, please give me your 9s." You must already hold at least one card of the requested rank. If the player you ask has any cards of the requested rank, they must give all of their cards of that rank to you. In the example, Barb would have to give you all of her 9s. If you get one or more cards from the player you ask, you get another turn. You may ask any player for any rank you already hold, including the same one you just asked for. If the person you ask has no relevant cards, they say, "Go fish." You then draw the top card from the draw pile. If you happen to draw a card of the rank asked for, show it to the other players and you get another turn. If you draw a card that's not the rank you asked for, it becomes the next player's turn. You keep the drawn card, whatever rank it is. The next player says, "Go fish." When you collect a set of four cards of the same rank, immediately show the set to the other players and place the four cards face down in front of yourself. Go Fish continues until either someone has no cards left in their hand or the draw pile runs out. The winner is the player who then has the most sets of four. Rather than asking for a rank, you must ask for a specific card. You must already hold at least one card of that rank. For example: "Charlie, please give me the king of clubs." If Charlie has it, he gives it to you and you go again. Otherwise, he says "go fish" and you draw from the draw pile. If you happen to draw the card you asked for, you get another turn. If you draw anything else, it is now the next player's turn. Before playing this way, all players should agree whether you can ask for a card you already have in your hand. If you ask for such a card, you'll have to go fish and your turn will end -- but it might benefit you to do this so the other players think you don't hold that particular card. When the draw pile runs out, keep playing until all of the cards have been made into sets of four. When the draw pile is exhausted, no one says "Go fish." If you ask someone for a card she doesn't have, it becomes her turn.